The New Holland Small Square Baler. This is a great industry for your horse farms, your smaller dairy farms, and beef farms, anyone that has to handle small square bales by hand. 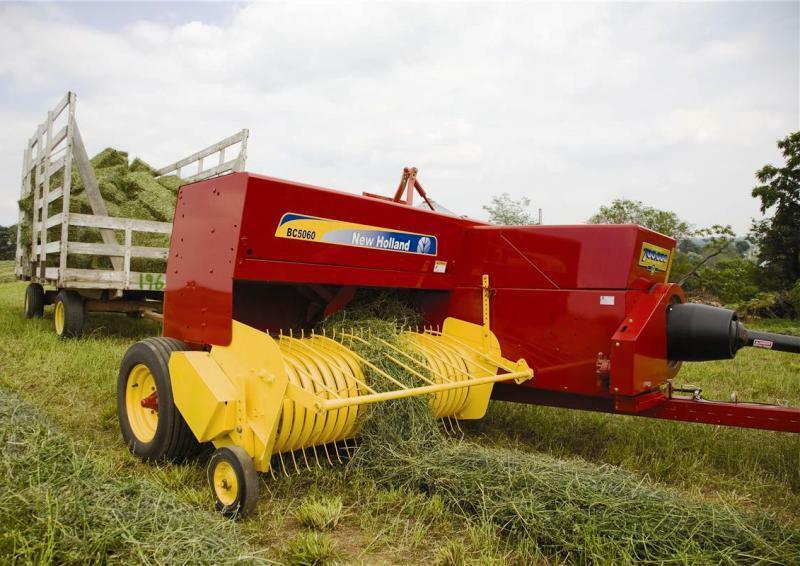 New Holland makes three different models of the baler, which basically range in the size of the pickups and the capacity which they can do. This is a BC5060. It would be the mid-size one. It’s a 65-inch wide pickup on this baler. Again, this baler would be targeted to our horse farms, hobby farms, and anybody that’s producing the small amount of small square bales. As we do, we hook to the tractor in the front of the baler. It’s going to take about a 60 to 70 horsepower tractor to run this baler, we prefer a little more if you’re on hills. When hooking to a wagon, we’d like to see it then up in the 80 to 100 horsepower. But if you’re just going to run it small and flat land, you can get away with that 70 to 80 horsepower tractor. So our hay is going to come through, it’s going to get picked up by our super-sweet pickup. It’s designed with a bent tooth in it, to gather the hay up, take it in to our cross feed, which is a rotary type feeding system. It feeds the hay over into our bale chamber. There, the hay is being cut by a knife, it’s going back through our bale chamber. It’s going to get tied off by our self-tying knotters and continue out the back of the baler into our wagon. As we were saying, the hay will come off the pickup. It will go into our cross feed. This is a rotary feeding type system. It brings the hay across into our bale chamber. From our bale chamber, our plunger is going to compress the hay into the bale chamber. It will go into our knotters, which is a self-tying knotter. How that works? Our twine comes from our twine box. In down through, into our needles, and our needle brings the twine up into our knotters. There, the bale hook will grab it, twist it, tie it in a knot and the knotting process is done. The baler itself, you can adjust the length of the bale, and how that is done is off of a metering wheel. As the hay moves through the bale chamber it ticks on our star wheel which moves up the bale length indicator. As you can see, it works its way up. When it gets to the top of its cycles, it trips. That activates the needle that ties off your bale. Lot of guys will bale anywhere from a 28-inch to a 36-inch bale depending on what their customers are asking for or what fits best in their operation. So as the hay continues back through the bale chamber, it comes this baler is equipped with a thrower. It will head into the thrower. It’s a hydraulic-drive belt thrower. It catches the bale, kicks it back into a kicker wagon, it continues to add on until the wagon is full, and you repeat the process. 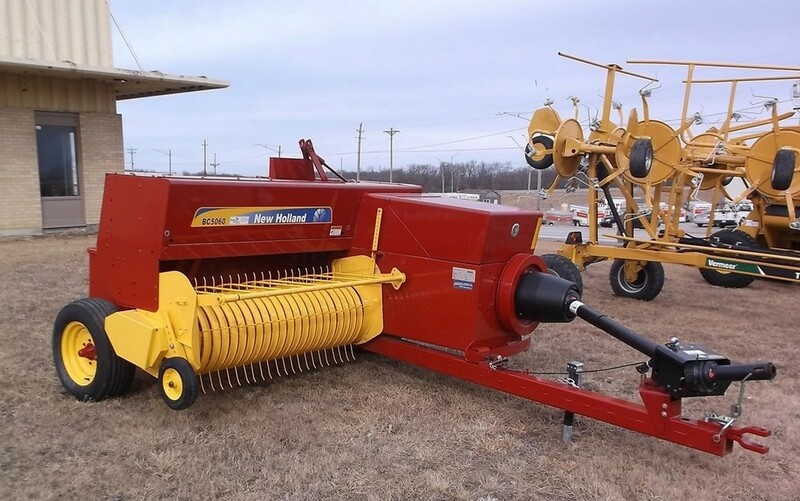 To continue on with the small square baler market, this baler isn’t for everyone. If you’re a high output, high capacity customer, you might want to look at a large square baler get more hay in the barn faster. But If you’re looking for getting the most amount of money, per ton of hay, the small square baler industry is where it’s at. Like I said, New Holland offers three models depending on how many bales you make per year. 0 Response to "New Holland BC5060 Small Square Baler"